While Vanuatu may not have the range of wartime wrecks like some other Pacific island countries, the idyllic island destination can offer plenty of deliberately sunken vessels to explore and enjoy. Of course, the SS President Coolidge on Santo is one of the most famous wartime wrecks anywhere in the world, but how do you “warm up” to a deep penetration dive like the Coolidge? In Port Vila, where international arrivals begin their Vanuatu explorations, you can acclimatise with any of these exciting wreck dives. MV Konanda was a trusty, seaworthy 45m vessel of 414 GRT that served her masters well. Built in the Netherlands for the Adelaide Steamship Company in 1954, she plied the waters of Australia, New Zealand and Vanuatu until 1987 when she was seriously damaged by Cyclone Uma and sunk later that year as a dive wreck. In just 25m of water, she is the perfect training wreck for divers who aspire to more challenging dives. Visibility is normally excellent. Star of Russia is a square rigged sailing ship full of history. Built by Harland & Wolff (makers of the Titanic) in 1875, she is almost 2000 GRT and 83m long and was fast, at 16 knots, for a big sailing ship. After a stellar career carrying cargo all around the world she ended up as a floating hulk in Port Vila and sank at her mooring around 1953 and lies in roughly 30m of water. A sad end for such a majestic vessel, but you can pay your respects and view much of her iron hull, masts and equipment in a busy dive. Visibility is not as good as other wrecks, but can be 15m in ideal conditions. MV Semle Federesen is another former island trader not unlike the Konanda in size and layout but began its career as a fishing boat in Europe. She was built in 1949 in France and sunk in 1985 in Vila after being declared unseaworthy. The wreck originally sat in shallower waters, but cyclonic surges moved her to the present position at around 40m. Ease of penetration and great visibility make this an interesting wreck and perfect progression dive for those heading to Santo. 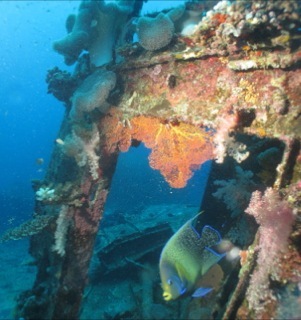 Offshore Moso Island (North Efate), is the Belama wreck. It was built by the British in Hong Kong for their colony in the Gilbert & Ellice Islands (now Kiribati), then went to the Solomons as a Government cargo vessel, before coming to Vanuatu as an Island Trader. After a heavy life in Vanuatu, she was badly damaged in a cyclone and scuttled in 20 metres of water. It is now a favourite dive site in clear water and home to lots of interesting marine life. Finally, for those who are ready for a tougher 40m dive, the Tasman (VH-EBW) is your challenge. Not a ship, but a once proud Short Sandringham four-engined flying boat of the Qantas fleet that flew all around the South Pacific. In June 1951, it hit a reef while avoiding a canoe that strayed into its path and was damaged beyond repair. After languishing on the beach for some time, it was eventually towed into the south-eastern corner of Port Vila Harbour, sunk and forgotten. Visibility is normally poor, often as low as three or four metres, but the hull is in surprisingly good condition. Several of the dive shops in Port Vila offer expert dive guidance and instruction at these sites, so you can be sure of a rewarding and safe experience.